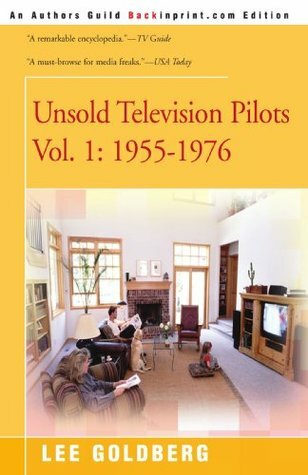 This non-fiction book chronicles a work spanning decades and culminating in a massive book detailing TV series that were created but rejected for long term viewing.This reference book is written as a list divided into TV season years and subdivided into networks and genres. Each entry gives you info about the stars, the plot of the pilot, the production companies and sometimes more info about whether the pilot was sent in a different direction or whether it was stopped there and then. The author explains where the idea for the book originated and writes an entertaining forward about pilots-where they came from and where they lead to.The book is not meant to be read as a book per se, but more to be referenced back to for the parts to be looked up. A very interesting list, but I was hoping for a few more explanations as to why the pilots never made it any further. I do commend the author on the dedication it must have taken to compile this epic tome.Thanks to Netgalley for the chance to review the book. Lee Goldberg - #1 New York Times Bestselling author Lee Goldberg is a two-time Edgar Award and two-time Shamus Award nominee whose many TV writing and/or producing credits include "Martial Law," "SeaQuest," "Diagnosis Murder,""Hunter," "Spenser: For Hire," "Nero Wolfe," "Missing." "Monk" and "The Glades." He's also the co-author of the Fox & O'Hare series with Janet Evanovich (The Heist, The Chase, The Job, The Scam, The Pursuit etc), "The Walk," "Watch Me Die," "King City," the "Dead Man" series, as well as the "Diagnosis Murder" and "Monk" series of original mystery novels.